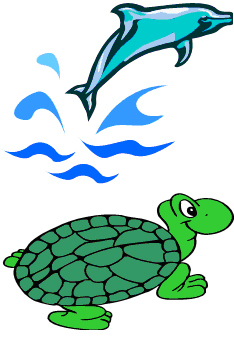 Our 3 to 4 ½ year old classes run on Tuesday and Thursday from 9-11:30 (Dolphin class) and 12-2:30 (Turtle class). We also offer a class that runs on Monday and Wednesday from 8:30-11:00. The cost is $155 per month. We have a one time $80 registration fee. Our class size is 18-24 students and 2 teachers. If the class goes over 18 we add a third teacher. We offer a balance of academic and social opportunities for the children in these classes. Our goals are to introduce new concepts, help with problem solving, sharing and taking turns. We want the children in these classes to get comfortable in a school setting so they are successful when they attend our 4 to 5 ½ year old classes. We ask that children coming into these classes be potty trained. Because we are a Lutheran preschool we also add a spiritual element to our program. Children learn about God’s love and care for them during Bible time and Chapel. We also offer an enrichment class on either Monday or Wednesday afternoons from 12:00-2:30 for the morning and afternoon groups. This class gives students a chance to explore enrichment activities related to our weekly themes. We offer cooking, science experiments, movement, music, outdoor activities and art projects. The cost is $70 a month. If you would like more information about these classes, please contact the preschool office at (360)357-7634.